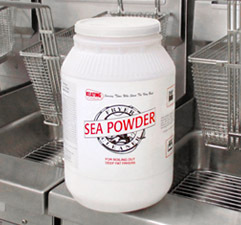 Keating Sea Powder is easy to use and superior at removing carbonized grease build-up in fryer vessels – the leading cause in premature fat breakdown. If used weekly, your fat will last one to two days longer, and your fryer will be in perfect condition for years. Sea Powder contains no caustic ingredients and a small amount, mixed in hot water, makes an excellent cleaner for greasy floors, walls and exhaust hoods too.